By Sarfraz ManzoorBoth Jacobs and Walters grew up in the 1940s, watching Westerns but never seeing any black actors in major roles. The 1956 John Ford film The Searchers, based on Alan Le May's novel, was partly inspired by the exploits of Brit Johnson, a black cowboy whose wife and children were captured by the Comanches in 1865. In the film, John Wayne plays as a Civil War veteran who spends years looking for his niece who has been abducted by Indians.Comment: So much for the idea of Johnny Depp's doing the Lone Ranger "authentically." If the movie were really authentic, it would feature a black protagonist with a Native sidekick. For more on the Lone Ranger, see Michelle Shining Elk on Johnny Depp and 2nd Lone Ranger Trailer. 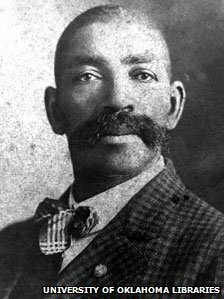 Below: "Bass Reeves was one of the first African-American lawmen."